The Barbie Blog: NIB Collection Additions! Today I have some Barbie goodness. You are all going to LOVE them! First, remember the picture of Daring Charming I was talking about when I created that post on him? (The one with my darling boy playing with him?) I found the picture. It was just so comical, he looks like a fallen King with his crown falling off. Hysterical! Before I feature my NIB dolls, I rescued a couple from the thrift store. They had a LOT of dolls there but nothing really caught my eye. All were naked, newer body style. If they were old then yes, I would have snatched them right up. Some had chewed hands from pets. I have enough of those already. But these two really needed a good home so I picked them up. They have been bathed because my Captain Tornado wanted to give them kisses so I had to clean them up. I love this one's hair! Purple streaks! And she was just an all around pretty doll. Believe me, her hair did not look this good. She had frizz frizz frizz and so many tangles I had a hard time getting them out. Because of that she got a boil dip last night. It's better but still not where I want it. It will take more work. She came with the cute sparkle capris and then I washed the white lace top and put it on her. It's the only shirt that somewhat matched the capris and that I had readily available. Hubby has been working on our yard that we have not had any time to fix up the doll room. So dolly's and accessories are still buried in storage. I'm hoping soon I can get them out! The capris, do they really belong to her or to someone else? This one, had a little tinge of pink by her brow and at the tips. You know me and dolls with pink hair! Because of the pink, I didn't mind that she had a permanent swimsuit. I knew that I had a doll with that same necklace. So I washed her and the pink washed right out so I figured it was marker. Then I looked again and the pink was still there. Maybe I was looking at a different part of the hair when I didn't see it. No biggie, I can take a pink sharpie and give her some awesome streaks to match. Then as I was brushing her hair the pink was reappearing. So I stuck her head under icy water. Yep, turned pink. Then it hit me like a ton of bricks. 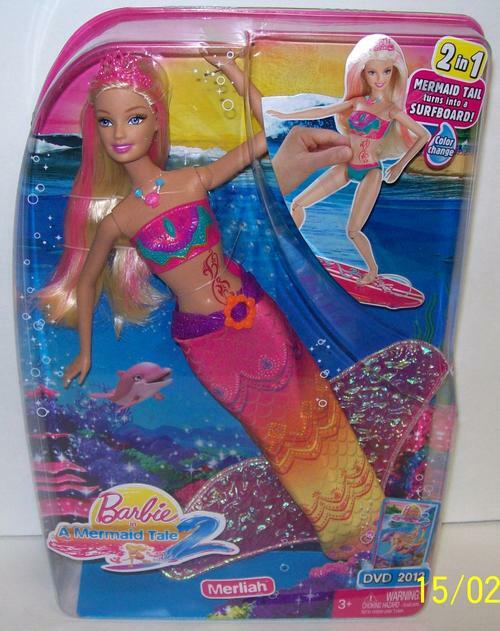 This is the Princess Merliah Transformation doll from Barbie, A Mermaid Tale. The doll where her tail turns into a surfboard. Remember that I have this Merliah doll. Her hair changes to pink as well but for some reason, the Princess Merliah I just got, her tattoo didn't appear. Oh well. I still love the hair. Okay, now on to the NIB additions! My dad picked these ones up for me. So awesome! First today, we have the most beautiful 1996 Blossom Beauty Barbie! Back of the box reads: "Barbie asked her flower fairy in the garden to make her party dress. The fairy sprinkled Barbie with glitter and her dress magically opened to reveal blossoms in colors of the rainbow. Ken thinks Barbie is the prettiest flower of all!" And you can also hide your sparkle fairy in the dress so you can have glitter to transform your dress at any time (and also by pulling the string.) I'm going to have to watch YouTube to see how this looks. So many questions but I don't want to take her out of the box! Okay, watch this. It all makes sense now. The dress opens up. :) Don't you just love the old jingles of commercials? I wonder how much someone got paid to write that song, haha. Now we have another awesome doll. This is a beautiful AA 2000 Teacher Barbie! She even comes with a chalkboard that really writes! Also included in the accessories are a pencil sharpener, erasers and some personal boards for the students to hold (I think). On the back of the box we see that it includes three subjects: dinosaurs, music and geography! I love her. I'm glad I have a teacher doll now as the hubby is a teacher! Anyone know if there is a Teacher Ken doll? And the last for today. This is the special edition 1997 Carnival Cruise Barbie! How cute is she with those star earrings and sailor outfit? And the hat! 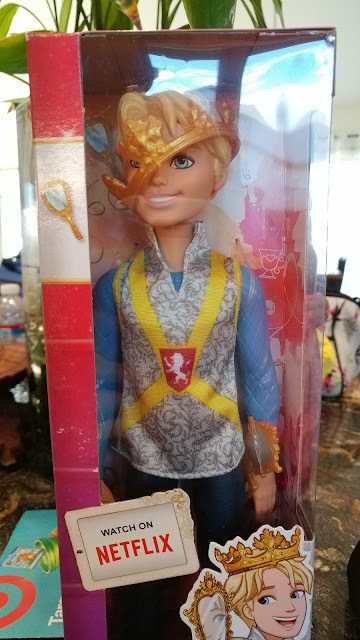 The back of the box reads: Barbie looks her nautical best as she gets ready for all the excitement and fun of her first ever Carnival "fun ship" vacation! Well that's it for today friends. Have any of these dolls made their way into your collection? Let me know in the comments! I'll have more unboxed goodness in the next post. Stay tuned! What a nice group of dolls! None of the Salvation Army/Goodwill stores near me seem to have very many toys at all. I have a little bit of hope for garage and yard sales this summer. I like that AA face so much better than the new one. The new one just looks ticked off. I found a sailor hat in the pile of misc Barbie stuff I bought today. I don't think it is this one though. You definitely got a great haul! That picture of Daring is hilarious. Must have been a very wild party at EAH. Great additions to your collection. I'm drooling over Carnival Cruise's outfit. Barb, I hope you get some this summer! I'm hoping to stop by some yard sales and see if I can get a good score. 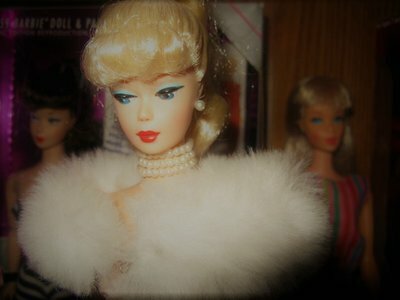 Dolls where I live seem to be scarce lately! Mel, Donny Osmond! LOL! You know, he kind of does! I hope you can put together a nice nautical outfit to go with the hat you got. I like the nautical dolls, there is something special about them to me! Andrea, thanks for the ID! I'm going to have to go on a spree and find that two-toned purple top. love love love it! The Carnival Cruise outfit is definitely drool worthy. It's just so perfect for Barbie! I have 3 dolls with that necklace... and pink in the hair. One at least i am sure is a Princess Merliah. She has the tattoo. Andrea, I was sorry to see your page is gone. You always give such good information! Plus you write well, and keep it interesting! Mel, can't wait to see what mermaids you found in your haul! Both Princess Merliah's have the same necklace. If it looks like the one pictured, you for sure have one of the two. Can't wait to see!